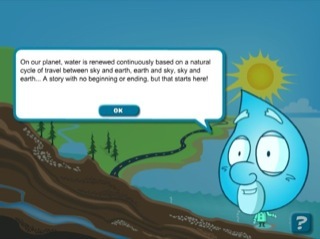 Credits screen featuring a character in the form of a drop of water with a cartoon speech bubble presenting the introductory text. There is an "OK" button. There is a "?" button to return to the introductory page any time. On our planet, water is renewed continuously based on a natural cycle of travel between sky and earth, earth and sky, sky and earth... A story with no beginning or ending, but that starts here! The screen shows an illustration representing the sky, the earth and what is underground. There is a sun, clouds, lakes, rivers and an ocean. There are arrows pointing towards the earth and from the ocean pointing to the sky symbolically representing the effect of evaporation. 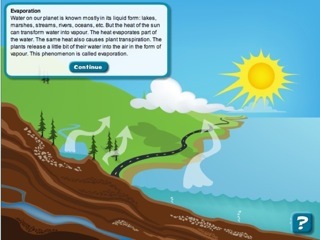 Above the illustration, there is an explanatory text, the "Continue" button and the title of this section, "Evaporation." Water on our planet is known mostly in its liquid form: lakes, marshes, streams, rivers, oceans, etc. But the heat of the sun can transform water into vapour. The heat evaporates part of the water. The same heat also causes plant transpiration. The plants release a little bit of their water into the air in the form of vapour. This phenomenon is called evaporation. The sun disappears, replaced by a huge grey cloud moving towards the earth. Above the illustration, there is an explanatory text, the "Continue" button and the title of this section, "Condensation." When water vapour comes in contact with cold air in the atmosphere, it condenses: it forms clouds in the sky. This phenomenon is called condensation. The screen shows an illustration representing the sky, earth and what is underground. There is a sun, clouds, lakes, rivers and an ocean. 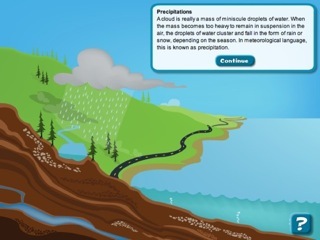 Above the illustration, there is an explanatory text, the "Continue" button and the title of this section, "Precipitation." A cloud is really a mass of miniscule droplets of water. When the mass becomes too heavy to remain in suspension in the air, the droplets of water cluster and fall in the form of rain or snow, depending on the season. In meteorological language, this is known as precipitation. The cloud disappears, the sun reappears and arrows appear on the earth and underground symbolically representing the effect of surface run-off and infiltration. 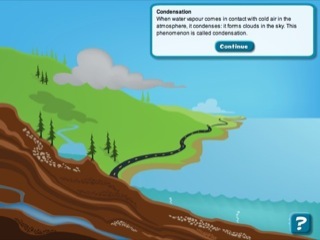 Above the illustration, there is an explanatory text, the "Continue" button and the title of this section, "Surface Run-off and Infiltration." 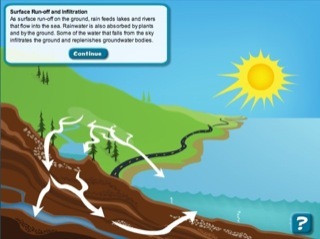 As surface run-off on the ground, rain feeds lakes and rivers that flow into the sea. Rainwater is also absorbed by plants and by the ground. Some of the water that falls from the sky infiltrates the ground and replenishes groundwater bodies. Title screen presenting the end and the concluding text. There is a "View again" button. 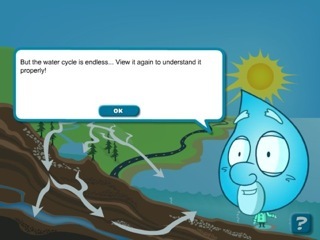 But the water cycle is endless... View it again to understand it properly!